Bathtubs demand a faucet depending on their design and placement in the bathroom. That makes you speculate and choose a faucet type, which will be good, durable, and won't demand a change even if you change the whole bathtub. For such installations where you install once, and forget later works on it, the wall mount tub faucet is a good choice. 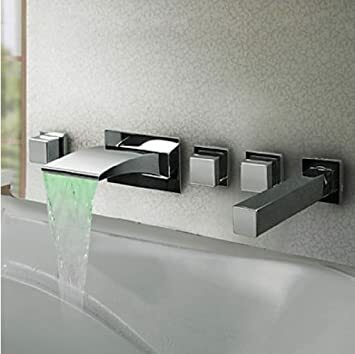 The advantage with wall mount faucets is that they can be fitted on to any style bathtub, provided the holes drilled in a bathtub for deck mount faucets are blocked before the installation so that no water leaks out of the tub. Any type of bathtub can be filled with a wall mount faucet, and no requirement of deck of floor mount faucet will be required. But for that the tub must be placed close to the wall. If the tub is placed centrally in the bathroom, then a wall mount tub faucet is of no good use in your bathroom. There must be an adjoining wall beside the tub head to install the faucet. Later if you change the tub in future you won't have to change the faucet with the tub.